The new downtown arena in Moncton is nearing finish, and is suggested to even be ahead of schedule. Ground was broken on the $100-million facility in spring 2016. Project director Steve Leger said everything was on time and on budget at that time. But with stormy weather throughout the long fall and winter, Leger said some aspects of the construction became a little more difficult. “Getting the exterior masonry walls, you've got to hoard them in and heat them. Getting the roof done you've got to pick your days [...]” said Leger. That being said, Isabelle Leblanc, of the City of Moncton, says there has been no short of interest since the launch of the project. “Since we announced the facility the phones started ringing and emails started coming from promoters who are interested in bringing in acts and shows into the facility as of 2018. We're even getting inquiries about 2021,” Leblanc said. ETG is proud to announce that Alpolic FR material was chosen by the design team to add punch to the entranceway of the new Downtown Moncton Arena. In addition, the rain screen system supplied by Vicwest (dry joint system) was chosen for its performance in all weather conditions. Combine the two elements together and the new downtown arena is guaranteed to be a stunning and safe piece of architecture that will draw in visitors for years to come. The building has helped generate lots of interest in the city's downtown core. Renovations and new projects are popping up on every corner to compliment the arenas modern design and to accommodate the downtown core's growing demand. "A lot of buildings are being revamped, repurposed, and we're seeing groundbreaking on a number of properties with new buildings coming up,” said Leblanc. 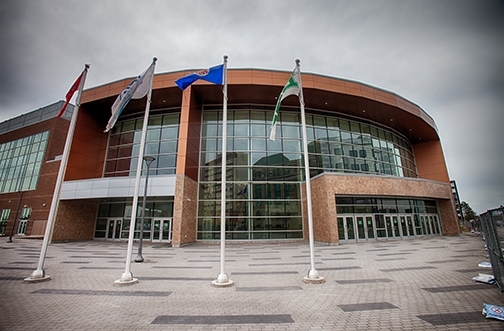 Bird Construction is set to turn the keys over to the city and arena operator and SMG Canada. The official opening is scheduled for September 2018.